CyberKnife offers a non-invasive option for cancer treatment, and is often used in conjunction with other treatments to provide our patients with the best options available for their cancer care. Why do they call it CyberKnife? CyberKnife does not use a knife, but rather uses highly-targeted radiation delivery to treat cancerous tumors and malignant cells without actually having to cut anything. 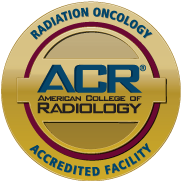 Utilizing advanced tumor-tracking technology and real-time imaging, CyberKnife tracks cancerous cells during treatment, allowing for the most accurate delivery of radiation while avoiding surrounding tissues and organs. CyberKnife is capable of delivering stereotactic radiosurgery (SRS) treatments, as well as, stereotactic body radiotherapy (SBRT) or stereotactic ablative body radiotherapy (SABR). Unlike traditional stereotactic radiosurgery, CyberKnife is not bound by limited angles of delivery, but rather it is able to deliver treatment from virtually any angle because of its advanced robotic arm. And because CyberKnife treatments are non-invasive, they can be performed in our comfortable outpatient treatment center. Most patients complete their treatment in one to five sessions, which take place over the course of one week. Because of this, they also experience minimal side effects and can generally return to normal activities almost immediately. Comments Off on What is CyberKnife?